Today I want to talk about a trend that I’m starting to see in the IM world more and more lately. It some thing that really dives me nuts. What is it? Its people launching training products when they are not qualified to be training people. Case in point. Today I was approached by on Facebook to promote a new product called “$500 in 24 hours”. Well I thought to myself who wouldn’t like to earn $500 a day? So I decided to take a look at the JV page and ask him a few questions before getting my review copy. The JV page did not describe the product at all so my first question was exactly what it was. The second question was if he actually made money with this himself. Where did that $500 in 24 hour figure come from? Here he is telling me that he has made money with the method that this training teaches continually, that its based around product launching, and then he quickly changes the subject to remind me that this product launch pays affiliates 100% commissions. Now for some affiliates thats going to be enough, he said he makes money with it, and it pays 100% of the sales price to the affiliate, so they will promote. However for me his word is not enough. He needs to show me that he has made money and knows what he is talking about before I promote. 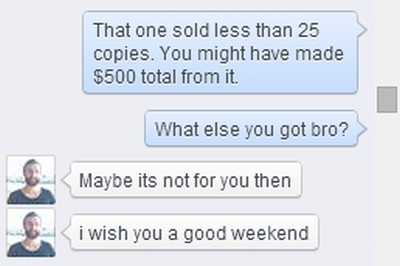 You can see that he tries to avoid the question by telling me I can make up to $63.90 per sale if I promote for him. But I pushed it and made him send me a link to one of his products. He should have several at least if he is going to be teaching people how to make money with product launches. 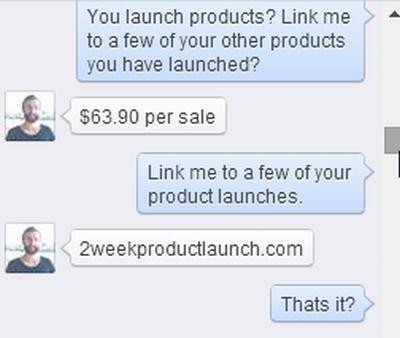 In fact he claims he has made $500 in 24 hours several times with product launches so I actually expected him to send me a few links to examples. But thats the only one he sent. The example that he sent is on JVZoo and as a affiliate for JVZoo I can easily see stats on its sales. The sad truth is that this product sold less than 25 copies. I pointed this out to him and once again asked for a link to a successful product launch. One that qualifies him to teach people how to make “$500 in 24 hours” by launching products. His response said it all. Basically when pushed to show a product that has made him $500 in 24 hours he not only cant produce, he just gives up on the entire conversation. It seems obvouse why he does not just show me proof. Because he has none to show. Another example is a gentlemen who also approached me on Facebook that is selling a product that claims to teach people how to go from 0-100 options per day. Well if this guy is going to teach people how to get 100 optins per day then he must have a really big list right? So I asked him to show me proof of his list size, and thus proof that he is qualified to be teaching this. His reply was that he has no list at all and that his entire training product was just re-branded PLR. These are just two examples. I see things like this very often. People who are not qualified to do training trying to teach people. It honestly drives me nuts. It gives the IM business a bad name and in truth these people who are not above lying or being deceptive are the dark side of this business. Now I understand that people want to get into product launching because it can be super profitable (in more ways than one), but if you dont have experience then you should not be making training products. For sure you should not be making training products that have nonsense claims in them. Its bad for the buyers, its bad for the affiliates, its bad for the product creators. Its just bad business all around. This does not mean that people who are new cant do a launch. There are several types of products that people can make even though they have no experience. In fact recently I did two JV’s with people where I walked them through the steps of creating and launching products. Nether of these products where training because the people I was helping had no experience to do training. Yet both of them did well and made money. There really is no need at all for new people to be making training products backed by false claims. I just dont understand it. It really bothers me that people are paying their money to get training and lots of times they are getting untested, unproven methods from people with little or no experience. Yes, definitely Brett. There is so much supposedly ‘the best training you ever need’ products, that we are all drowning in what one to actually use. These examples show how some IM marketers are scamming the public, which gives IM Marketing a bad name. Thanks for showing us these examples. Unfortunately, because of some of the easy graphic creator tools out there, like Squeezematic, people can give the impression that they are big time gurus, not small time scammers. By the way, how successful was the PLR product that you helped a new marketer with? It did well considering I did not use any of my affiliate contacts to get it extra promoted. Steve had been trying to earn money online for a couple of years with virtually no success. From this small launch he made around $850 net profit for himself in just over 48 hours and continues to get residual sales. Last time we spoke he had bought himself a new guitar with some of his new IM earnings. (Steve is an old school rocker). I actually feel really good about helping him. He not only got a bit of cash infusion, he now has a product to sell evergreen. Even better he has finally ‘seen the light’ on how to make money and has motivation to continue with what I taught him. I totally agree with everything you’ve said above Brett – that’s why your product reviews are so valuable to us SOS sufferers! I, for one, would be very interested in any training that you put out…. It is good to highlight this practise, although I must admit without any form of legislation (god help us if they go down that route) we are stuck with it. As is so often the case it comes down to good old due diligence and overcoming that desire to purchase off the back of a well honed sales letter. Newbies may not be so lucky but I think when we started, we all went down some rabbit holes after being sold products by the snake oil salesman. I would be very interest in anything you develop Brett. You have a proven track record for creating viable and profitable products and software. It would be worth it for me to go through the training you are thinking of doing, just to be able to have a heads up about products and to be able to do some due diligence on them as you have. It appears this would be the only way to really know before purchasing. It is getting to the point I am very reluctant to purchase from anyone I have not had experience with in the past. With false scarcity, to overblown sales letters, to unqualified trainers, it is almost impossible to know what is true and what is not true without being on the inside. In fact, folks I have purchased from in the past that have had products I have used very much, are now resorting to false scarcity, etc. to make sales projections. Not sure that it helps when two very successful and well known marketeers have just launched a software and training about how to structure a successful sales presentation, and make the claim in their sales video that a well structured sales presentation can sell crap products if all the parts of the sales presentation are followed correctly. This is really no different than almost everything else we face every day. Just a few years ago, we would have been horrified at the prospect of $3.00 a gallon for gas. Slowly but surely, we have been conditioned to now think $3.00 a gallon gas is like finding the pot of gold at the end of the rainbow. So it is with the IM world, there has been a steady decline in honesty and morals when it comes to selling online, and we as consumers generally think nothing of it. It is our responsibility to accept all the hype or not. If nothing else, you have taught us to read the sales page carefully, and to pay attention to what is and what is not being said. I can attest it has saved me from purchasing when I am not comfortable about the product or the person selling it. I really love your no nonsense approach to business. back IM product launch and promotion bandwagon. next poor soul who gets sucked in. Unfortunately some people will do anything for a quick buck. And yes, the moral state of IM in general is appalling. Unfortunately these kinds of misleading products keep coming up in the IM space as more and more newbies come on the market each month. Yes I’d be keen to hear more of what training product(s) you have in mind Brett. Hey Brett, if you create the training program, I’m definitely on board! Great job Brett you’ve exposed yet more impostors pretending to be internet marketers, I love to see you do some training that teaches us the correct way of going about internet marketing. I would welcome what you have to offer. I have bought some of your software, and I am satisfied with them. Without giving away any names, there is a successful script writer who you know and who cranks out great, online marketing software. I have bought some of his products. My problem with him is, he either forgets about his customers when they have a support issue, or he doesn’t have a support staff. 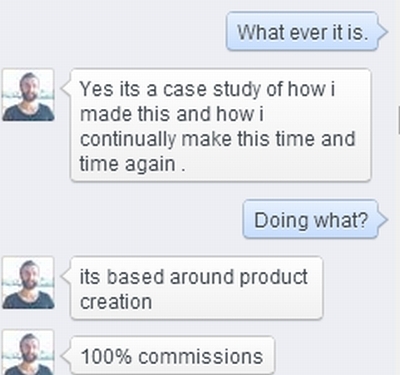 One script I bought from him worked like he said it would on his sales page. But, after a few months it was no longer working. I wrote to his support section and never got a response. He apparently likes to team up with another well-known I M er, who I will not name, and they seemed to come out every 3 or 4 months with new software that trumps their previous efforts. I guess that’s their current biz model. Anyway, that’s enough of my rant. By the amount of replies you go so far I believe the signs are pretty clear about your next direction Brett. READ YOUR BLOG FIRST … LOL! Hi Brett, definitely do the training if you have time – what you have talked about today is one of reasons I have stayed away from launching products – I don’t want to “appear” as though I am qualified to train people when I know I am not. You can do launches without them needing to be training. There are lots of other things new people can do. Seriously, it would be great to get a solid overview on how to put all these tools to use and various strategies on how to to make real money online! I think CPA/Affiliate marketing is the best way to learn the nuts and bolts within controlled spending tests. Profits and knowledge learned from success campaigns could then be funneled into actual product development, which is another course in itself! It would be great to see what you come up with! I always Love how you get to the truth ..YOU ROCK!!! Thank You!